King's Quest VI: Heir Today, Gone Tomorrow is the sixth installment in the King's Quest series of adventure games produced by Sierra Entertainment. 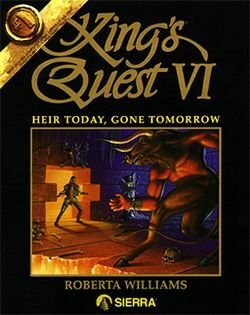 Written by Roberta Williams and Jane Jensen, KQVI is widely recognized as the high point in the series for its in-depth plot, landmark 3D graphic introduction movie (created by Kronos Digital Entertainment), and professional voice acting (Hollywood actor Robby Benson provided the voice for Prince Alexander, the game's protagonist). KQVI was programmed in Sierra's Creative Interpreter and was the last King's Quest game to be released on floppy disk. A CD-ROM version of the game was released in 1993, including more character voices, a slightly different opening movie and more detailed artwork and animation.